By Monica Mollica. Whey protein is the highest quality dietary protein source. No wonder it is a very popular protein supplement. I often get questions about what the difference is between the different whey protein powders that we can find on the market, and which of them is “best”. We have whey protein concentrates, whey protein isolates, micro-filtered whey protein isolates, ion-exchange whey protein isolates, and hydrolyzed whey proteins. Let’s get it straight once and for all. Whey protein is one of two the major milk protein (the other being casein). Whey is separated from milk, and advances in processing technology (such as ultrafiltration, microfiltration, ion-exchange and reverse osmosis) have resulted in development of several different finished whey products1-11. Whey protein concentrates, reduced lactose whey, whey protein isolates and hydrolyzed whey products are now available on the dietary supplement market. Each whey product varies in the amount of protein, carbohydrate (lactose), fat, minerals and specific bioactive proteins like alpha-Lactoglobulin, beta-Lactoglobulin, immunoglobulins, glycomacropeptide, bovine serum albumin, lactoferrin, lactoperoxidase) 7, 10, 12. An overview of all the benefits of whey protein compared to other proteins like casein, egg and soy is an article on its own. Here I will briefly outline some of whey’s beneficial effects. Whey protein is a rich source of highly bioavailable essential amino acids (especially leucine) 13-15. In fact, whey protein has been singled out as the ultimate source of protein on the basis of its excellent amino acid profile and digestibility 13, 16. In addition, whey protein has several other interesting effects that are especially relevant for athletes and physically active people alike. Whey protein has been shown to increase glycogen stores in muscles and the liver, when compared to a casein-based diet containing an identical amount of carbohydrate 17. Whey protein is also a rich source of the sulphur containing amino acid cysteine 18, 19. This is noteworthy because cysteine is the crucial limiting amino acid for glutathione synthesis in the body 20-23, and dietary cysteine is considered to be a rate limiting substrate for the synthesis of glutathione 24. Glutathione is a potent antioxidant and is also necessary for lymphocyte proliferation and immune function 20-22, 25, 26. Without getting too much into details, there are also indications that increased levels of glutathione (by changing the so called redox state) can alter gene expression in a way that promotes muscle growth 27. It has actually been shown that consumption of whey protein concentrate results in higher levels of glutathione in tissues 28, 29, and that the immuno-enhancing effect of whey protein to a large extent can be ascribed to its ability to increase glutathione levels 24. A very interesting study compared supplementation of 20 g whey protein concentrate (see below for more info about whey protein concentrates) per day with supplementation of 20 g casein per day, for three months 19. The results showed that supplementation with the whey protein concentrate significantly increased lymphocyte glutathione levels with over 35%, and also improved peak power and 30 second maximal work capacity 19. There were no changes observed in the casein group. In addition, the subjects who had supplemented with the whey protein concentrate (but not casein) experienced a decreased percentage body fat while maintaining their body weight 19! These results are certainly of relevance for athletes and physically active people who want to improve their health and get in shape. Whey protein isolate has the highest protein concentration (90-95%) and contains very little (if any) fat, lactose and minerals. Whey protein concentrate has a protein concentration ranging from 25-89%. 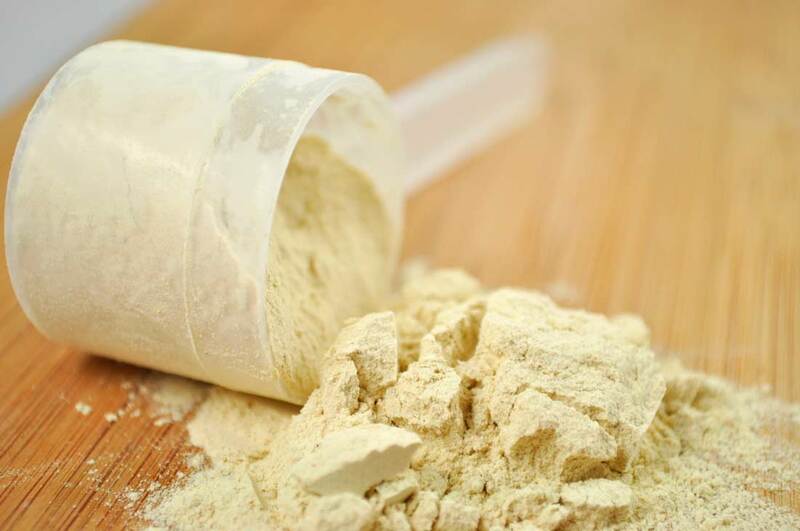 Most whey protein concentrate products have a protein concentration of 80%. Whey protein concentrates contain some lactose, fat and mineral. Another major difference between whey protein isolates and whey protein concentrates is that whey protein isolates are lactose free and a more expensive. Ion exchange is a processing technology that is used to concentrate the protein content in the powder. Protein powders with the very highest protein contents per gram are ion exchanged isolates. However, this type of processing has serious drawbacks in that it literally wipes out all the valuable and health promoting subfraction peptides like alpha lactalbumin, glycomacropeptides, immunoglobulins, and lactoferrin, which are naturally found in whey. Instead it contains a high amount of beta-lactoglobulin which can cause allergies. There are several different types of micro filtrations technologies. They are all used with the purpose to enrich (or concentrate) various subfractions from the whey. The popular micro filtrations technologies are Cross Flow Micro filtration (CFM®) ultra filtration (UF), reverse osmosis (RO), dynamic membrane filtration (DMF), ion exchange chromatography, (IEC), electro-ultrafiltration (EU), radial flow chromatography (RFC) and nano filtration (NF). The micro filtration techniques allows for the production of powders of high quality (undenatured) protein with very high protein contents (>90%). Micro filtered when proteins retain important subfractions, and are low in fat and lactose, so they are definitely worth their higher price. Clearly, hydrolyzed whey protein is the most popular protein hydrolysate among athletes. However, there are also casein hydrolysates and hydrolysates from other proteins available in dietary supplements. So to wrap it all up: if you’re lactose intolerant, chose whey protein isolate. If you can tolerate small amounts of lactose, don’t bother too much with whey protein isolates; they are not worth the premium price. Instead choose a whey protein powder that is based on whey protein concentrate (containing at least 80-85% protein). Whey protein concentrates are not only cheaper than whey protein isolates but also contain more bioactive and health promoting substances. Try to find a whey protein concentrate powder that has some hydrolysates mixed in it. It is true that hydrolysates are more expensive than concentrates, but they (in contrast to isolates) are worth their price. Hydrolysates will not only simultaneously increase amino acid availability and insulin to your muscles (and thereby maximally stimulate muscle protein synthesis and inhibit muscle protein breakdown), but will also make the powder easier to mix without causing lumps in your shaker. Practical and effective! Also, pick a product that is low in carbs and sugar. Now you know what to look for in a whey protein product. 1. Li CP, Enomoto H, Ohki S, Ohtomo H, Aoki T. Improvement of functional properties of whey protein isolate through glycation and phosphorylation by dry heating. J Dairy Sci. Dec 2005;88(12):4137-4145. 2. Fox PF, Mulvihill DM. Developments in milk protein processing. Food Sci Tech Today. 1993;7:152-161. 3. Huffman LM. Processing whey protein for use as a food ingredient. Food Tech. 1996;50:49-52. 4. Kosikowski FV. Whey Utilization and Whey Products. J Dairy Sci. 1979;62:1149-1160. 5. Schmidt RH, Packard VS, Morris HA. Effect of Processing on Whey Protein Functionality. J Dairy Sci. 1984;67:2723-2733. 6. Etzel MR. Manufacture and use of dairy protein fractions. J Nutr. Apr 2004;134(4):996S-1002S. 7. Huffman LM, Harper WJ. Maximizing the value of milk through separation technologies. J Dairy Sci. Oct 1999;82(10):2238-2244. 8. de Wit JN. Marschall Rhone-Poulenc Award Lecture. Nutritional and functional characteristics of whey proteins in food products. J Dairy Sci.Mar 1998;81(3):597-608. 9. Matthews ME. Whey Protein Recovery Processes and Products. J Dairy Sci. 1984;67:2680-2692. 10. Modler HW. Functional Properties of Nonfat Dairy Ingredients – a review. Modification of Lactose and Products Containing Whey Protein. J Dairy Sci. 1985;68:2206-2214. 11. Heeboll-Nielsen A, Justesen SF, Thomas OR. Fractionation of whey proteins with high-capacity superparamagnetic ion-exchangers. J Biotechnol. Sep 30 2004;113(1-3):247-262. 12. Marshall K. Therapeutic applications of whey protein. Altern Med Rev. Jun 2004;9(2):136-156. 13. Ha E, Zemel MB. Functional properties of whey, whey components, and essential amino acids: mechanisms underlying health benefits for active people (review). J Nutr Biochem. May 2003;14(5):251-258. 14. Walzem RL, Dillard CJ, German JB. Whey components: millennia of evolution create functionalities for mammalian nutrition: what we know and what we may be overlooking. Crit Rev Food Sci Nutr. Jul 2002;42(4):353-375. 15. Yalcin AS. Emerging therapeutic potential of whey proteins and peptides. Curr Pharm Des. 2006;12(13):1637-1643. 16. Bucci LR, Unlu L. Protein and amino acids supplements in exercise and sport. In: Wolinsky I, Driskell JA, eds. Energy-yielding macronutrients and energy metabolsim in sports nutrition. Boca Raton, FL: CRC Press; 2000:191-212. 17. Morifuji M, Sakai K, Sanbongi C, Sugiura K. Dietary whey protein increases liver and skeletal muscle glycogen levels in exercise-trained rats. Br J Nutr. Apr 2005;93(4):439-445. 18. Anderson ME, Meister A. Transport and direct utilization of gamma-glutamylcyst(e)ine for glutathione synthesis. Proc Natl Acad Sci U S A. Feb 1983;80(3):707-711. 19. Lands LC, Grey VL, Smountas AA. Effect of supplementation with a cysteine donor on muscular performance. J Appl Physiol. Oct 1999;87(4):1381-1385. 20. Bounous G. Whey protein concentrate (WPC) and glutathione modulation in cancer treatment. Anticancer Res. Nov-Dec 2000;20(6C):4785-4792. 21. Monograph. Glutathione. Altern Med Rev. 2001;6(6):601-607. 22. Anderson ME. Glutathione and glutathione delivery compounds. Adv Pharmacol. 1997;38:65-78. 23. Stipanuk MH. Homocysteine, Cysteine and Taurine. In: Shils ME, Shike M, Ross AC, et al, eds. Moden Nutrition in Health and Disease. 10th ed: Lippincott Williams & Wilkins; 2006:545-562. 24. Bounous G, Batist G, Gold P. Immunoenhancing property of dietary whey protein in mice: role of glutathione. Clin Invest Med. Jun 1989;12(3):154-161. 25. Wu G, Fang YZ, Yang S, Lupton JR, Turner ND. Glutathione metabolism and its implications for health. J Nutr. Mar 2004;134(3):489-492. 26. Thomas JA. Oxidant Defense in Oxidative and Nitrosative Stress. In: Shils ME, Shike M, Ross AC, et al, eds. Moden Nutrition in Health and Disease. 10th ed: Lippincott Williams & Wilkins; 2006:685-694. 27. Burdon RH. Superoxide and hydrogen peroxide in relation to mammalian cell proliferation. Free Radic Biol Med. Apr 1995;18(4):775-794. 28. Bounous G, Gold P. The biological activity of undenatured dietary whey proteins: role of glutathione. Clin Invest Med. Aug 1991;14(4):296-309. 29. Bounous G, Gervais F, Amer V, Batist G, Gold P. The influence of dietary whey protein on tissue glutathione and the diseases of aging. Clin Invest Med. Dec 1989;12(6):343-349. 30. FitzGerald RJ, O’Cuinn G. Enzymatic debittering of food protein hydrolysates. Biotechnol Adv. Mar-Apr 2006;24(2):234-237. 31. Manninen AH. Protein Hydrolysates in Sports and Exercise: a brief review. J Sport Sci Med. 2004;3:60-63. 32. Adler-Nissen J. Enzymatic hydrolysis of proteins for increased solubility. J Agric Food Chem. Nov-Dec 1976;24(6):1090-1093. 33. Adler-Nissen J. Enzymatic Hydolysis of Food Proteins. London: Elsevier; 1986. 34. Grimble GK, Rees RG, Keohane PP, Cartwright T, Desreumaux M, Silk DB. Effect of peptide chain length on absorption of egg protein hydrolysates in the normal human jejunum. Gastroenterology. Jan 1987;92(1):136-142. 35. Grimble GK, Silk DB. The optimum form of dietary nitrogen in gastrointestinal disease: proteins, peptides or amino acids? Verh Dtsch Ges Inn Med. 1986;92:674-685. 36. Rees RG, Hare WR, Grimble GK, Frost PG, Silk DB. Do patients with moderately impaired gastrointestinal function requiring enteral nutrition need a predigested nitrogen source? A prospective crossover controlled clinical trial. Gut. Jul 1992;33(7):877-881. 37. Rees RG, Payne James JJ, Grimble GK, Halliday D, Frost PG, Silk DB. Glycine nitrogen in total parenteral nutrition: two prospective clinical trials comparing the efficacy of high and low glycine containing amino acid solutions. Gut. Jun 1992;33(6):848-854. 38. Silk DB, Grimble GK, Rees RG. Protein digestion and amino acid and peptide absorption. Proc Nutr Soc. Feb 1985;44(1):63-72. 39. Grimble GK. Mechanisms of peptide and amino acid transport and their regulation. In: Furst P, Young V, eds. Proteins, peptides and amino acids in enteral nutrition. Basel: Karger and Nestec; 2000:63-88. 40. Adibi SA. Intestinal transport of dipeptides in man: relative importance of hydrolysis and intact absorption. J Clin Invest. Nov 1971;50(11):2266-2275. 41. Collin-Vidal C, Cayol M, Obled C, Ziegler F, Bommelaer G, Beaufrere B. Leucine kinetics are different during feeding with whole protein or oligopeptides. Am J Physiol. Dec 1994;267(6 Pt 1):E907-914. 42. Monchi M, Rerat AA. Comparison of net protein utilization of milk protein mild enzymatic hydrolysates and free amino acid mixtures with a close pattern in the rat. JPEN J Parenter Enteral Nutr. Jul-Aug 1993;17(4):355-363. 43. Moriarty KJ, Hegarty JE, Fairclough PD, Kelly MJ, Clark ML, Dawson AM. Relative nutritional value of whole protein, hydrolysed protein and free amino acids in man. Gut. Jul 1985;26(7):694-699. 44. Poullain MG, Cezard JP, Roger L, Mendy F. Effect of whey proteins, their oligopeptide hydrolysates and free amino acid mixtures on growth and nitrogen retention in fed and starved rats. JPEN J Parenter Enteral Nutr. Jul-Aug 1989;13(4):382-386. 45. Silk DB, Chung YC, Berger KL, et al. Comparison of oral feeding of peptide and amino acid meals to normal human subjects. Gut. Apr 1979;20(4):291-299. 46. Ziegler F, Ollivier JM, Cynober L, et al. Efficiency of enteral nitrogen support in surgical patients: small peptides v non-degraded proteins. Gut.Nov 1990;31(11):1277-1283. 47. van Loon LJ, Kruijshoop M, Verhagen H, Saris WH, Wagenmakers AJ. Ingestion of protein hydrolysate and amino acid-carbohydrate mixtures increases postexercise plasma insulin responses in men. J Nutr. Oct 2000;130(10):2508-2513. 48. van Loon LJ, Saris WH, Verhagen H, Wagenmakers AJ. Plasma insulin responses after ingestion of different amino acid or protein mixtures with carbohydrate. Am J Clin Nutr. Jul 2000;72(1):96-105. 49. Calbet JA, MacLean DA. Plasma glucagon and insulin responses depend on the rate of appearance of amino acids after ingestion of different protein solutions in humans. J Nutr. Aug 2002;132(8):2174-2182. 50. Bennet WM, Connacher AA, Scrimgeour CM, Jung RT, Rennie MJ. Euglycemic hyperinsulinemia augments amino acid uptake by human leg tissues during hyperaminoacidemia. Am J Physiol. Aug 1990;259(2 Pt 1):E185-194. 51. Biolo G, Declan Fleming RY, Wolfe RR. Physiologic hyperinsulinemia stimulates protein synthesis and enhances transport of selected amino acids in human skeletal muscle. J Clin Invest. Feb 1995;95(2):811-819. 52. Biolo G, Tipton KD, Klein S, Wolfe RR. An abundant supply of amino acids enhances the metabolic effect of exercise on muscle protein. Am J Physiol. Jul 1997;273(1 Pt 1):E122-129. 53. Biolo G, Williams BD, Fleming RY, Wolfe RR. Insulin action on muscle protein kinetics and amino acid transport during recovery after resistance exercise. Diabetes. May 1999;48(5):949-957. 54. Fryburg DA, Jahn LA, Hill SA, Oliveras DM, Barrett EJ. Insulin and insulin-like growth factor-I enhance human skeletal muscle protein anabolism during hyperaminoacidemia by different mechanisms. J Clin Invest. Oct 1995;96(4):1722-1729. 55. Fukagawa NK, Minaker KL, Young VR, Rowe JW. Insulin dose-dependent reductions in plasma amino acids in man. Am J Physiol. Jan 1986;250(1 Pt 1):E13-17. 56. Svanberg E, Moller-Loswick AC, Matthews DE, Korner U, Andersson M, Lundholm K. Effects of amino acids on synthesis and degradation of skeletal muscle proteins in humans. Am J Physiol. Oct 1996;271(4 Pt 1):E718-724. 57. Yang RD, Matthews DE, Bier DM, Wen ZM, Young VR. Response of alanine metabolism in humans to manipulation of dietary protein and energy intakes. Am J Physiol. Jan 1986;250(1 Pt 1):E39-46. 58. Bohe J, Low A, Wolfe RR, Rennie MJ. Human muscle protein synthesis is modulated by extracellular, not intramuscular amino acid availability: a dose-response study. J Physiol. Oct 1 2003;552(Pt 1):315-324. This entry was posted in Articles, Sports Nutrition on March 9, 2012 by SNI.